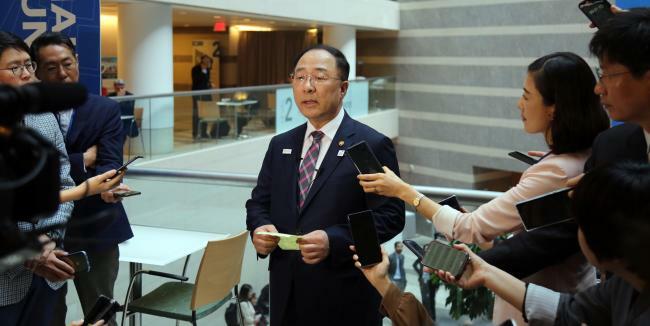 South Korea's finance minister called on the United States to exempt it from new import duties on imported vehicles at meetings of Group of 20 finance ministers and central bank governors held in Washington last week, the ministry said Sunday. Hong Nam-ki, the minister of economy and finance, made the request to US Treasury Secretary Steven Mnuchin on the sidelines of the annual international conferences on the global economy and other issues. Mnuchin said he fully understands what the Korean minister requested from the US in terms of auto import tariffs and expressed hope that the issue will be resolved without difficulty, though no decision on the issue has yet been made, the finance ministry said.